It was early for a summer Saturday, walking the few short blocks to downtown in the promising warmth to check out the annual Boulder Creek Harvest Festival. Several local bands were scheduled to play throughout the day, and it was there in the cooler shadows of the morning where I first heard JnJ Dynamite quietly smoldering. In that moment it all changed. It was as though I’d entered a dreamy, post narcotic state, like I’d stepped into the otherworld of a David Lynch movie. Her voice! And there was something mysterious about the music. It made me think about things. The layers of accompaniment nuanced and peeled back to reveal that stark, haunted vocal. Ripples of teenage nostalgia, joy riding and lazy summer days with nothing to do but hang out on the pier or ride the roller coaster over and over again. Classic cult of small town suburban America, settings both surreal and familiar; pieced together memories of youth and yearning and how to fill meandering time. 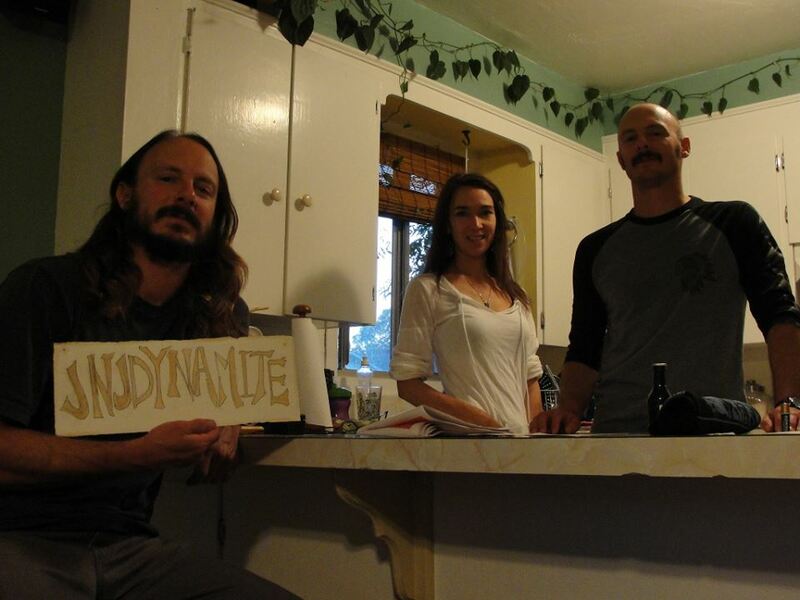 JnJ Dynamite is a semi-acoustic alt-folk trio based in the Santa Cruz Mountains. With a unique “lo-fi folk” sound, the band composes songs that are powerful and pure, that get down and thrill your soul. Lyricist Julie Di Mauro seems to write from a waking dream, lucid notes on psychological love stories both ethereal and down-to-earth. Her molten vocals drift and in and out of provocative piano arrangements that burn with a hint of discord and a twist of irony. Twin brothers, Dustin and Joel Di Mauro on electric and acoustic guitar provide a canvas of rhythm and sweet melody, while their backing vocals contribute to a sound that is complex yet strikingly spare. The brothers have played music for a long time together, a hobby which began while playing in their parents’ bands. 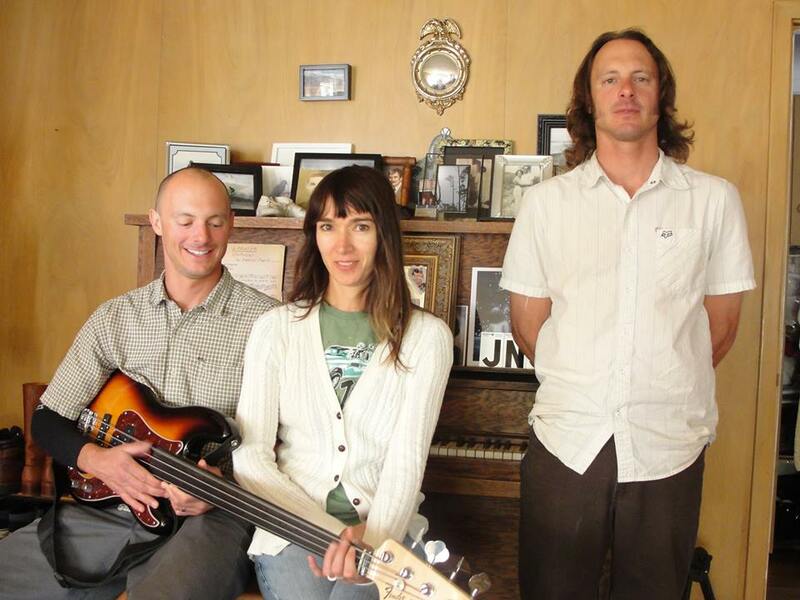 Joel married Julie and the three family members began making music together in 2008. And of living the dream, Joel says the band wants to continue playing shows locally but also further away, “I think road tripping to shows is fun.” Julie has the same idea. “I’d like to get out and see more live music, to support the arts and our community,” and spend some time working on and sharing her jewelry. “And then I would like to plan a mini tour for JnJ, a few stops on the Northern California coast.” Destinations yet untold but well worth road-trippin’ to. Experience JnJ Dynamite at lille aeske on Friday, March 25 2016. 13160 Central Ave (Hwy 9) Boulder Creek, CA. 95006. For more information, check out the Facebook Event.